And on the third day, God said “Let there be the faint beginnings of pleasantly cool air.” And it was good. Too pooped from the heatwave and sleepless nights to say much more than that folks. So I’ll just put up this refreshing and appropriately named cooler from the Godfather of Tiki courtesy of the modern-day court jester of tiki and call it a night. Combine all ingredients in a blender and puree until smooth. Pour into glass or goblet. 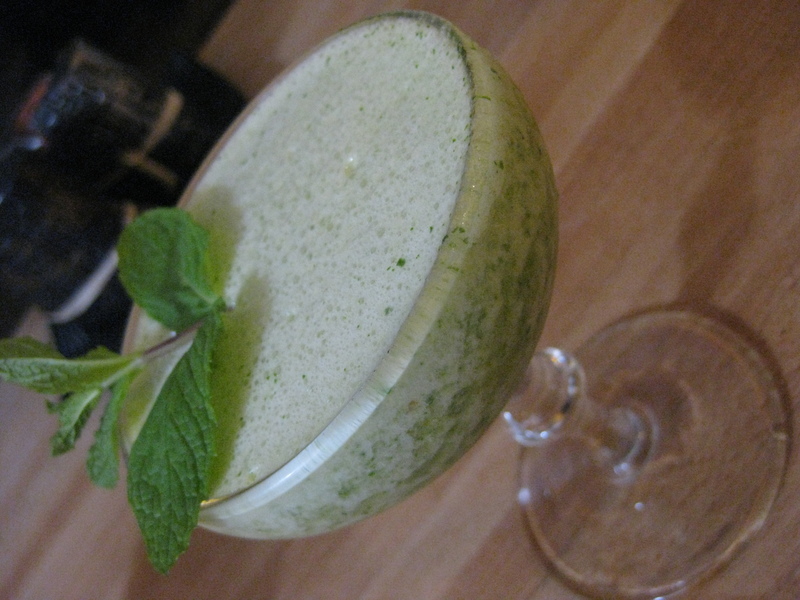 Garnish with fresh mint. Recipe courtesy of Don the Beachcomber via Forbidden Island. Sometimes you just need to get away from all the wrenches life throws at you. However, unless you are a trustafarian or founded your own tech company, flying off to the South Pacific in the middle of the week just isn’t an option. As a second best (or maybe twelfth best), there is always a tiki drink. Tiki has come a long way from the dark recesses of cheap rum, canned pineapple and reheated rumaki. Beyond just restoring the classics to their original state with high quality rum and fresh squeezed juices, folks are using these standards for some very interesting riffs and variations. This one is a twist on the mai tai, by swapping out the orange curacao with cinnamon syrup. It also layers in the vegetal funk of a rhum agricole along with the aged rums. The freshly grated cinnamon provides a really nice nose to the whole affair. Kick back, relax and forget the work week for a few hours. Shake with ice and strain into a rocks glass with crushed ice. Garnish with fresh grated cinnamon. Ernest Raymond Beaumont Gantt is a great name for a boy from Texas turned Prohibition-era bootlegger in the Big Easy. However, not so much for a guy running a Polynesian-themed restaurant in 1930’s Hollywood. Thus was Don the Beachcomber born. Having legally changed his name, Donn Beach took his colorful past running rum in Caribbean, working in Chinatown restaurants and traveling the world to single-handedly create the world’s first “tiki” bar, combining tropical inspired rum drinks with flared up Cantonese food. Celebrities flocked to his bar, which offered an escape from reality vibe. Ever had a mai tai with a pu-pu platter? If so, its because of this one guy. One of the classic tiki recipes that Donn created that is now enjoying a resurgence, this one combined a heady mix of three different rums tempered with some citrus, a little honey and a splash of fizz. Its a tiki twist on the historical grog of British Navy tradition, which was little more than high proof rum mixed with some water or beer to take the edge off. Donn’s version is refreshing and easily drinkable, but packs a real whallop underneath, just like the grogs of old. Story is Donn limited his customers to only two of these. Enjoy. Shake ice and strain into double old-fashioned glass filled with crushed ice. * Honey syrup is simply a 1:1 or 2:1 mix of honey and water, depending on your sweetness preference. Heat the honey and water until the honey completely dissolves. Let cool, then bottle. Rain, rain go away, come back some…well drat, we’ve had a drought here in the Bay Area for going on three years now. I can’t just wish away the rain now that we finally have a normal (read: totally wet) winter. This would all be perfectly agreeable as it would ordinarily mean fresh powder in Tahoe for me to enjoy Year Two of “Dave Learns to Ski” – a perfect winter. But I’ve been saddled with a seriously tweaked hamstring from an old injury which has left me hobbling around with a newfound appreciation for disabled ramps. So until I get my two left feet back, I’m stuck starring out the wet, drippy windows, daydreaming about sunshine and tropical beaches. As I can’t quite hop on the next plane bound for Hawaii – at least not yet – I’ll have to rely on Trader Vic to help me imagine myself in a Hawaiian Tropic ad. Blend with 1 cup crushed ice for 5 seconds and pour into collins glass or nautical tumbler. Add more crushed ice to fill. Recipe courtesy of A Mountain of Crushed Ice. For the grenadine, I combined the recipe from Tiare above with Jeffrey Morgenthaler. Take a couple of pomegranates and use a juicer or reamer to grind the heck out of it to extract as much juice as possible. Strain through a seive or cheesecloth. Measure juice and combine with equal quantity sugar and two or three hibiscus flowers. Warm (but do NOT boil) in a microwave to dissolve sugar. Let the flowers steep for an hour. Finish with a dash of orange flower water and bottle. Back in my much younger and much poorer days, I went on a solo road trip across the Appalachian South and into the Mississippi Delta. I was living in Boston and working as a community organizer for a small housing nonprofit, which meant my personal transportation was a subway pass. Lacking the funds to rent a car, I got one via a company that matched drivers with people looking to ship their cars affordably. Your only expense was paying for gas while your choice of destinations was limited to whatever they had available. I took off for a week and a half in late August in a Nissan that needed shipping from Nashua, NH to Houston -and more specifically, from Daddy’s leafy suburban McMansion to Princess’ off-campus condo near Rice University in Houston. Side trips to the Smokey Mountains, Graceland, B.B. King’s in Memphis, and Hope, Arkansas later, I wound up dropping off a car to Daddy’s Little Girl and realized Houston sucked. So courtesy of Greyhound, I hoofed it to New Orleans. New Orleans, of course, has far too many awesome things for a brief booze-post to fit: the Preservation Hall jazz band, the wrought-iron Garden District, chicory-scented cafe au lait with fresh beignets, ancient mausoleums, jambalaya… However, being as I was in my twenties, most of the reason I was there was to party until I couldn’t see straight – which, as anyone who has hit Bourbon Street discovers, is easier than ordering a pizza, courtesy of vendors selling giant mugs of boozy, red slushy concoctions called Hurricanes. From what I can dimly recall, Pat O’Brien’s, the bar that invented the drink, served endless supplies of the brain killing juice in an outdoor courtyard featuring a flaming water fountain of all things. In spite of the nasty sugary slurpee it was turned into, the original was actually a fairly tasty drink. Pat O’Brien, the original tavern owner in the 1940’s, was looking for a way to unload a lot of rum. During the war years, whiskey and scotch were in low supply, so distributors required bars to purchase quantities of the far more readily available rum before they could buy their quota of whiskey. Bred of necessity, Pat sold the drink in hurricane lamp-shaped novelty glasses to the ever present soldiers and sailors passing through town. And thus was a drink borne which would eventually become synonymous with Mardi Gras debauchery. This simplified recipe is surprisingly well-balanced and quite delish. Shake violently with ice and pour into goblet or large glass with ice shards. Garnish with cherry, pineaple or both. However, this cocktail does not involve a giant mug of ice nor does it require any blending. I first came across it at the Bay Area’s high temple of tiki drinks. Its creator published the recipe and since it involved making a weird syrup, I couldn’t resist. Seriously, Five-Spice Syrup?!?!? It’s an interesting and summery tipple, but in the future, I think I would dial back the syrup to 3/4 oz. as it came out rather sweet, overwhelming the rum. Shake with ice and strain into cocktail glass. Garnish with lemon twist. * For Five Spice syrup, combine one rounded teaspoon of Five Spice powder with 2 cups sugar and 1 cup water. Bring to boil then remove from heat to steep for 10 minutes. Strain off scummy bits and bottle. Courtesy of Martin Cate, Forbbiden Island. Living in the Bay Area, you eventually forget that most of the country is living in the middle of one season or another, each rather distinct. In Boston where I spent well over a decade, that meant long, dreary winters of icy cold, nasty wind, and grey skies, punctuated by the occasional snowstorm to make everything postcard pretty. Of course, that would last about a day and then the fluffy white snow turned into sooty piles of slush. Surving this meant investing in a good supply of long-johns, parkas and L.L. Bean duck boots – as well as making sure you were within spitting distance of a pub serving comfort foot and good stouts. Spring brought relatively warmer, but still uncomfortably cold weather – none of which mattered as it was raining all the time. The one upside was that the Red Sox would be playing again. Finally, summer would arrive and with it heat, heat and more heat, with a good dose of sticky humidity for good measure. You combated this with flip flops, shorts, fried clams, and weekends on Cape Cod. Finally, fall came and that meant crisp days, trees full of color, apple picking and the Head of the Charles regatta. It also brought streets filled with clueless, spoiled, college freshmen crowding the subway and that neighborhood pub of yours. Here in San Francisco, we seem to have less annoying college freshmen, but they are made up by the equally annoying hipster. Also, we mainly just get room temperature weather, with the outdoor thermostat set between 55 and 75, for pretty much the entire year. We get a few months of rain in the winter, a few months of chilly fog in the summer and the rest is some modest variation of 65, partly cloudy/foggy. However, the last few days we have had honest to God summer weather. Clear, sunny days. Temps hitting 90. Shorts and flip flop weather, where you even need some suntan lotion when you go outside. Its fantastic. Which means only one thing: I’m thirsty for a cold, fruity, tropical-esque drink. Combine all in blender, ice last. Flash blend for 5 seconds. Pour into mug. Courtesy of Jeff “Beachbum” Berry, Sippin’ Safari, via Kaiser Penguin. Add plenty of ice and shake like a demon until your hands are frozen numb. 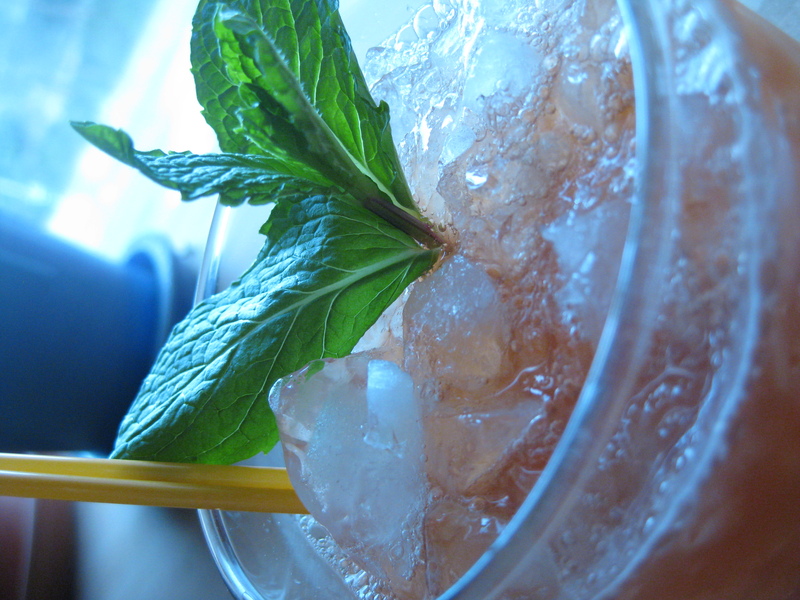 Strain into a glass and garnish with mint sprig. * I substituted Appleton Special, a medium “gold” rum for the Cruzan Dark, which itself is really a gold rum. Worked better than the Cruzan. Also added a dash of grapefruit bitters in addition to the Angostura. Mmmmm…..